4K video with rich gradation in addition to supporting simultaneous HD/SD. 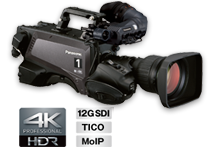 AK-HC5000 HD Studio Handy Camera allows for 1080p 4x high-speed shooting for vivid imaging of exciting moments in sports and events. A Studio and EFP Camera System for Broadcast Use That Delivers High-End Image Quality and Enables Long-Distance Optical Fiber Transmission at Low Cost. * This model is not available in some areas.